Photo credit: S.J. 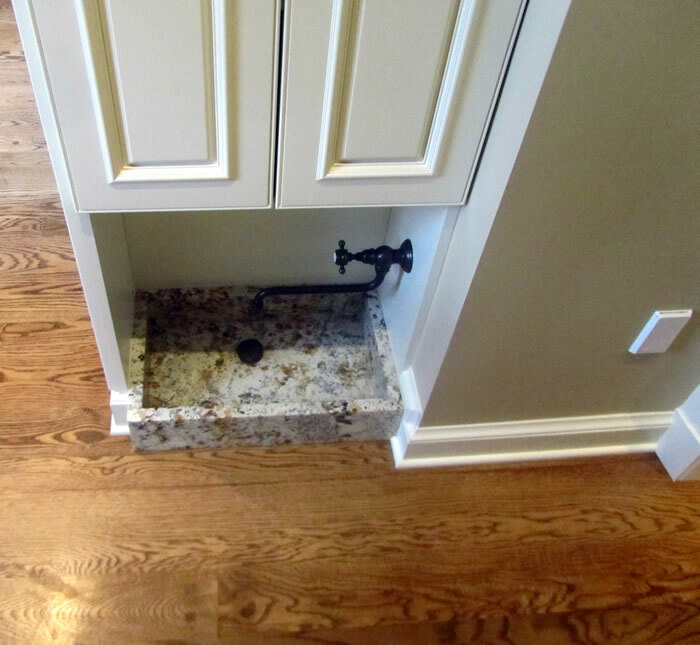 Janis Company, Inc.
A former laundry room sink is now a custom granite water station for the owner's dog. Designed by Valerie Hurst, Kitchens by Valerie. Feeding bowls are cleverly hidden in cabinety drawers. This door leads to a 65-square-ft cat-friendly room where cats can play and homeowners can store pet food, litter, etc. The door can be locked when pets need to be sequestered. Door design by Mark Ivy. The handles and locking hardware created by Alaska Forge. Tully uses the pullout steps to leave the dog-washing station. Photo credit: S.J. Janis Company, Inc.
To help curb a dog's curiosity, give him a peek with a PetPeek window. 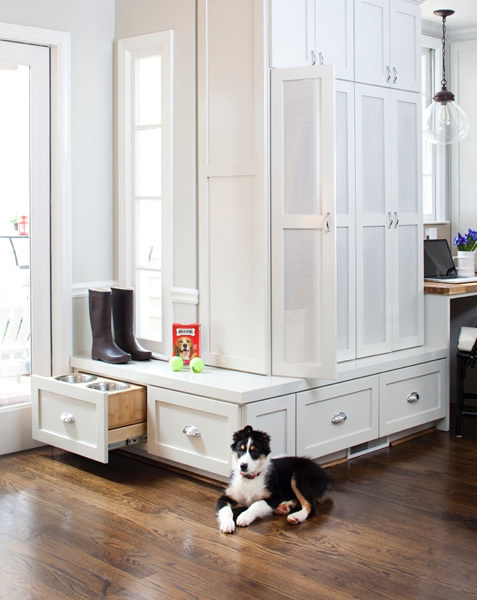 “Have you thought about the dog?” It’s probably not the first question on the minds of most designers, but Valerie Hurst, owner of Kitchens by Valerie, makes it a point to ask her clients about their pets’ needs. Valerie, along with other design and remodeling professionals, shared their favorite pet-centric ideas with us. Alaska dogs love to come home caked in mud or soaked by snow, so it’s no surprise that the most popular project Tim Patten, of WillowRidge Construction Company, can think of is a custom dog wash.
“It can be as simple as a standard shower unit with a handwand showerhead, or something more elaborate, like a curbed-off area in the garage with a drain and a spigot,” he describes. For bigger dogs, a floor-level wash area works fine, but owners of smaller dogs may find that an elevated stainless steel sink is easier on the back. 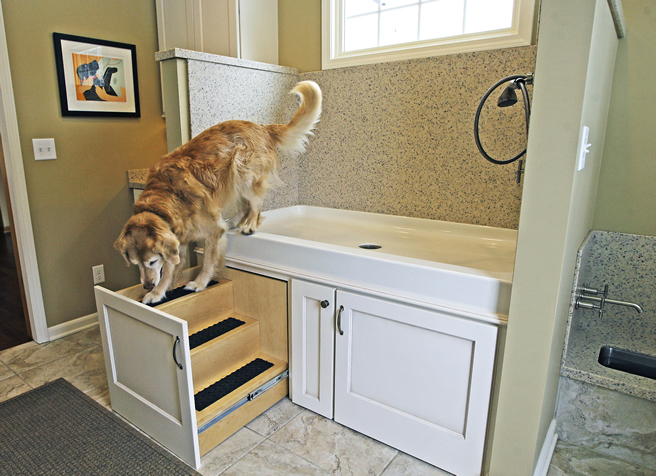 A built-in ramp will give your pets a way to climb into the sink. Dog owner and remodeling expert Stacey Dean of Grayling Construction finds that installing a four-inch drain line on the tub, instead of the standard three-inch, prevents clogs. Tim adds that you’ll likely get more than one use out of a wash station – such as rinsing off fishing waders or showering down a muddy toddler – and it may even help when it comes time to sell your home. For indoor/outdoor animals, access is a No. 1 priority on homeowners’ minds – but so are security and temperature control. “Doggy doors can allow for a lot of cold air to come inside,” explains Catherine Call, an architect with Blue Sky Studio. Her solution is to build an arctic entry, or use an existing one, to catch the cold air. A dog door built into a sort of “holding area” will also let Fido dry off before he’s allowed into the main house. 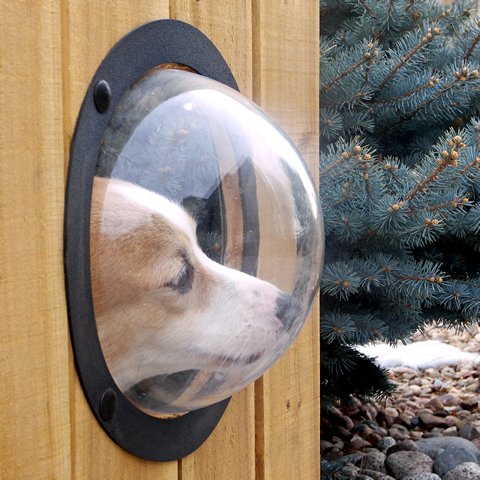 Still, a dog door may allow access into a home for more than just your dog or cat. “Security’s a growing concern in our times,” says Josh Sundstrom, president of WillowRidge Construction Company, which is why he has installed automatic dog doors for his clients. 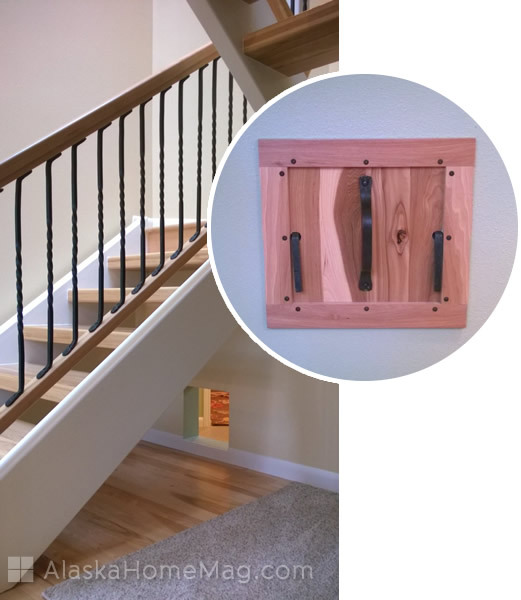 These can be activated electronically by a dog’s collar – or several collars on the same signal – to open only when pets get within a few feet of the door. Once they’re inside, though, pets still have a habit of making a mess. If you’re set on carpeted floors, Valerie suggests sticking to low-pile carpets for easy cleaning. Soft surfaces are also gentler on older pets with joint issues or arthritis. When creating spaces for your dogs and cats, you can take cues from your pets by noticing where they like to hang out – those spots on the floor where they prefer to lounge. 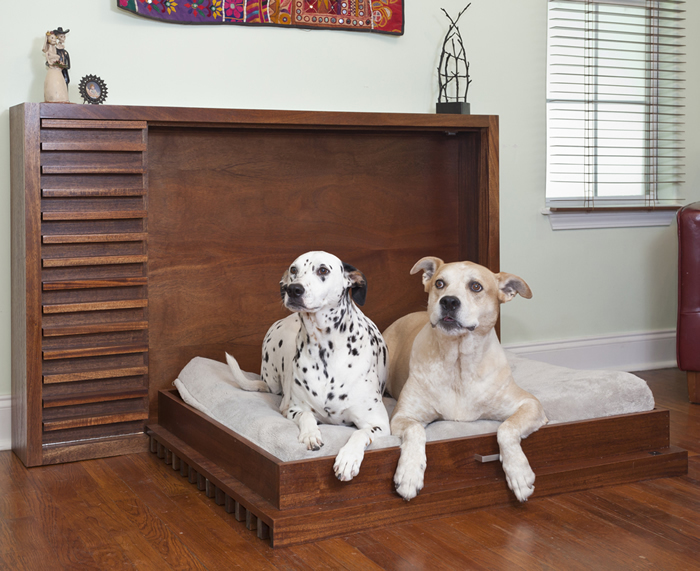 Consider adding a cushy bed there, or building a window seat where your pets can perch. “Dogs are less likely to bark when they can see what’s going on outside,” Valerie says. Niches are a popular trend, and not just for beds. “I’ve seen open spaces created under a counter where the food and water can live,” describes Catherine. “It’s out of the way, so you’re not tripping over it.” For once-a-day feeders, food dishes can be hidden in toe-kick drawers until it’s dinner time. Valerie likes to install magnetic locks on cabinets where food or pet medicine is stored, and finds that pull-out trash bins are especially popular for storing bulk dry food. Litter boxes can also be concealed inside existing islands or cabinets modified with a large door that gives you access for cleaning, plus a smaller door that allows entry for your cat. “Cats love to be up high, so making a tree they can climb is nice,” says Stacey, adding that to cover the tree, you’ll want to choose a tough carpet that can withstand scratching. Catherine, on the other hand, has been asked by one couple to create a walkway near the ceiling of the room so her client’s cats could walk around, explore and play. Practical or play-oriented, there are lots of ways you can make your pet feel more comfortable in your home. So, on your next remodeling project, don’t forget to think about your furry friends.